Surprisingly, I found myself missing the green teas I said goodbye to last week, but one taste of this week's tea and it was "Hello, Mr. 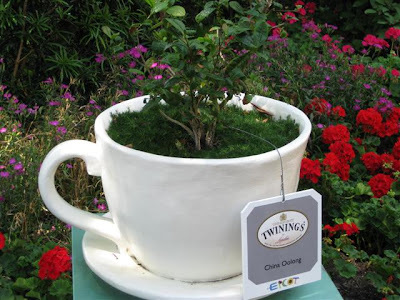 Oolong!" 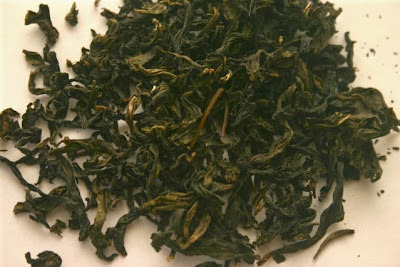 Dry leaf appearance: Long, ultra dark green tea leaves. I noticed when measuring they seemed especially rigid and didn't have any "give" to them. Wet leaf appearance: Dark olive green tea leaves that struck me as very large (1-1/2 inches or so) compared to those of recent weeks. Flavor: Wonderful! 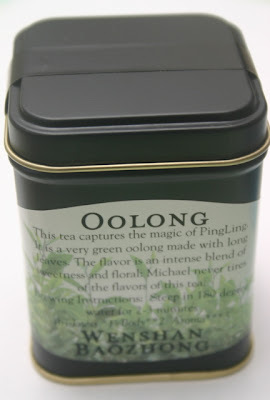 I've had oolong teas before, but this one had an especially nice "mouth feel" and just seemed richer, fuller somehow. 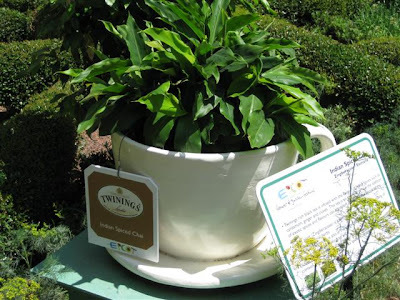 I resteeped the leaves and ended up having five cups of it before the day was over. I even drank this with dinner! Additional notes: From "The Harney & Sons Guide to Tea" -- "One of the oldest Taiwanese oolongs, BaoZhong grows just outside bustling Taipei, the island's capital. The gardens lie to the south of the city, in a quiet mountainside spot where the air is clear of urban smog and mist almost always cloaks the gardens." I love that this piece comes with small holes for hanging, and I've been mulling over precisely where it should go. 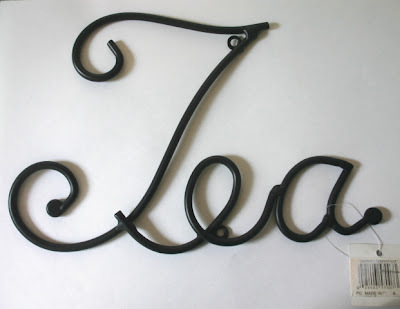 Under or over a tea-themed piece of art? Next to another piece of black ironwork that holds teacups and saucers? 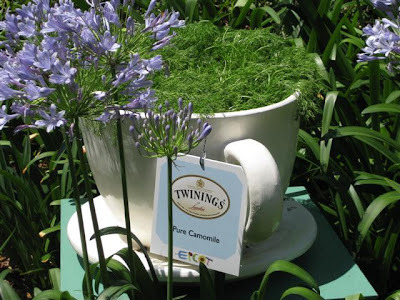 But then it would also look great hanging on my tea cabinet, the one where I pile teacups and accoutrements and tins of tea. So ... if someone had given you this lovely item as a gift, what would *you* do with it? Ideas welcome! Recently I was crocheting a small blanket as a gift for a family member. 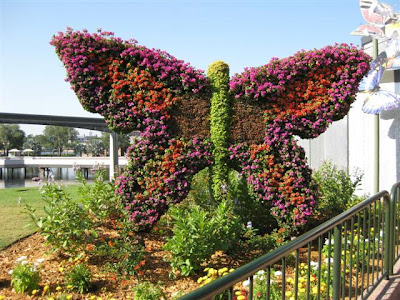 The pattern is a simple filet crochet heart design, in which you use open spaces and solid spaces much as you do with cross-stitch or needlepoint to create a design. 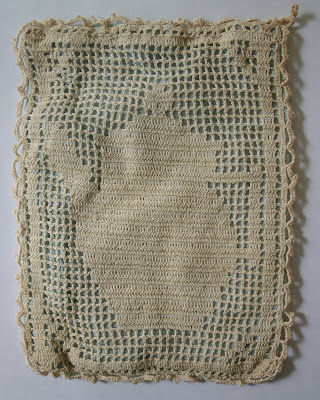 As I was working on it, I wondered why I have never seen a crocheted afghan with a filet crochet teapot design. "Maybe I'll make one," I thought (like I don't have enough to keep me busy!). The next day, I was trolling Etsy for old tea stuff and found not one but two teapot potholders in filet crochet -- somebody obviously had the idea long before I did -- and best of all, they were just $1 each! 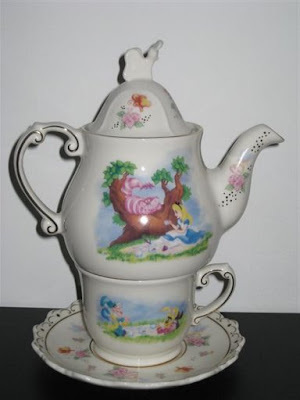 This one with a large teapot is my favorite. 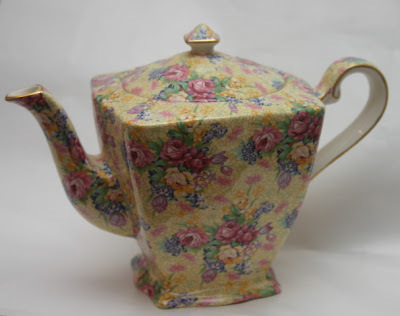 But I also like this one with its smaller center teapot and the stylized flowers, at least I think they're flowers, in the corners. 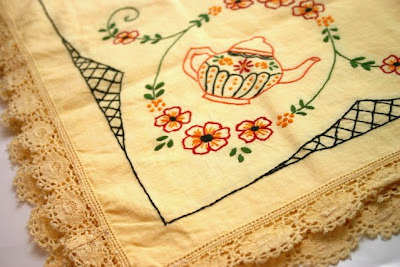 (Be sure to double-click if you're a needleworker who wants to see more detail.) Both of them are backed with light blue cotton and have some sort of filling inside, but I won't be using these for anything without a thorough soaking in detergent first! 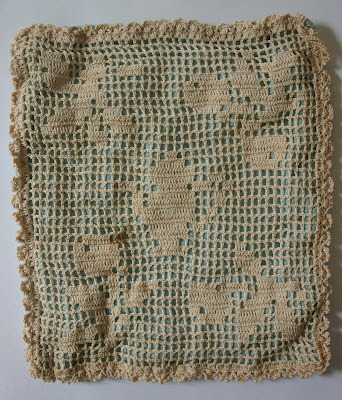 I still think I'd like to chart my own design and crochet a teapot afghan, maybe as a project for this fall or winter. Unless, that is, I find the afghan already made for $1 on Etsy! 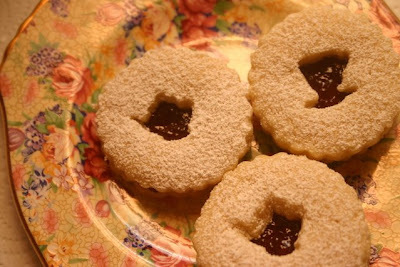 Are you interested in the history of Linzer cookies? OK, good! Linzer torte, the famous pastry in which the pretty fruit filling peeks through a lattice crust, hails from Linz, a town in Austria. 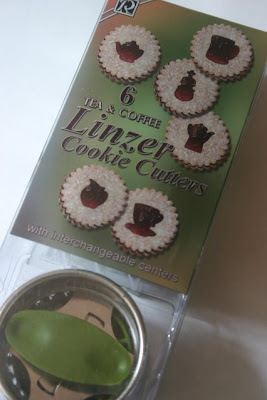 The Linzer cookie, with its fruit filling peeking through the top cookie with a cutout design, is a variation on that idea. The recipe printed on the back of the cookie cutter box did not work for me. The cookies had too much butter in them and were swimming on the cookie sheet by the end of baking time. So, I returned to a never-fail sugar cookie recipe I've been using (from the marvelous book "Cookie Craft"). It worked perfectly. I baked bottoms first, then the fun part, the cutouts. 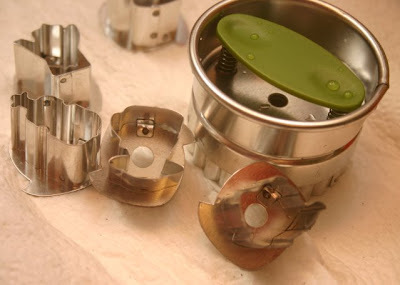 The tiny (less than one inch) impressions lock into place on the cookie cutter and pop out with a spring mechanism. There were no instructions, but it was pretty easy to figure out. I used seedless raspberry jam on the bottom cookies, then added the tops which I had dusted with powdered sugar (sifted through a tea strainer!) 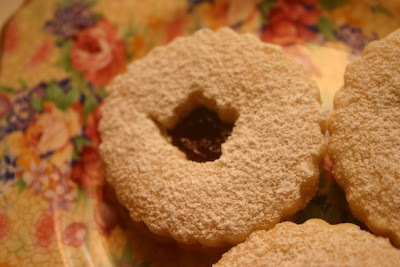 and yum -- Teatime Linzer Cookies! DH and I both thought they were really good. Happily, the cookie cutters all cleaned up easily in hot soap and water. I think I need to perfect my technique so as to get a "crisper" design in the middle, but for my first effort I'm pretty pleased! The other morning I was seated at my vanity in the bathroom blowdrying my hair. 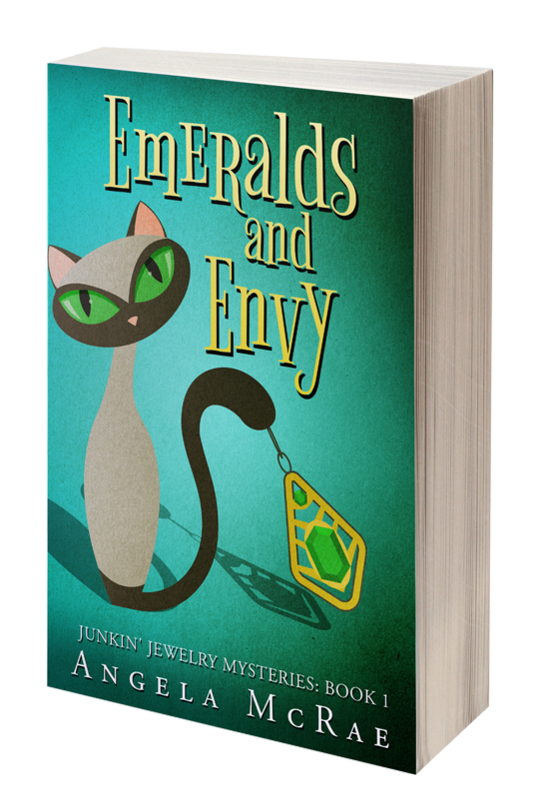 I didn't have any reading material within arm's reach, so I began to notice all the stray earrings that were scattered here and there on a tole tray. I'd been looking for an earring tree to organize pierced earrings, but suddenly it dawned on me I had the perfect organizational tool right at my fingertips. I removed all the tubes of lipstick, tweezers, etc. it had been holding, and soon my organizer was ready for its new use. I started lining them up (even the hoops I wear almost every day slide right over the rim), and I was thrilled at this discovery! 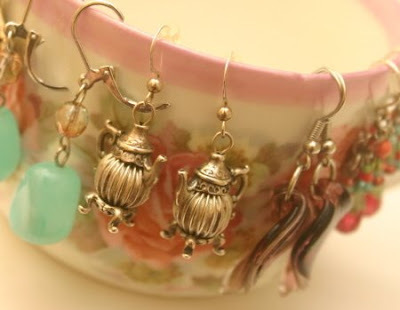 The "tea" earrings I wear most often are these silver dangling ones with fish hook wires that are perfect for this type of "organizing tool." 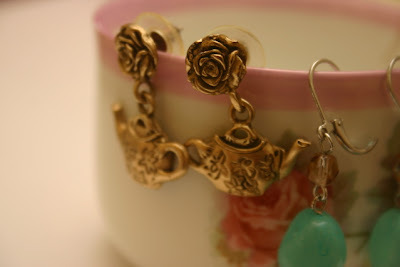 And recently I needed gold earrings and wore these rose and teapot ones, even though they're a tad on the gaudy side. 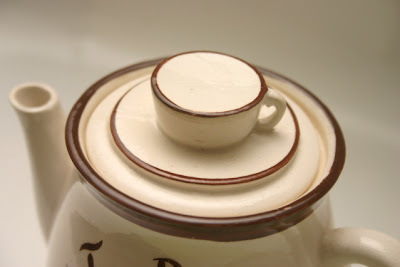 I was happy to see that posts with a "disc" style back can prop on the teacup rim as well. 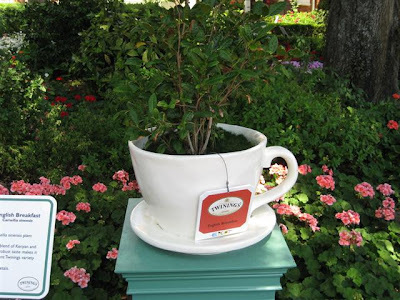 Do you have any interesting uses for orphaned teacups? I'd love to hear them! HAPPY MEMORIAL DAY! 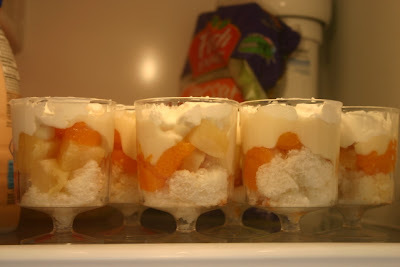 I hope you are planning to enjoy this year's observance of Memorial Day, and I thought it might be appropriate to share a quick and easy dessert idea I made this weekend. Almost every year at Christmas, I serve this glorious English Trifle that is made with angel food cake, red currant jelly, and this divinely thick, slightly tricky velvet cream custard that is super rich thanks to the 12 eggs yolks it contains. 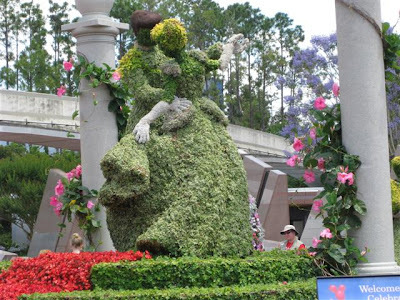 It is always a huge hit, and I think it is worth all the effort that goes into it. Well, this is *not* that recipe. This is that recipe's low-rent country cousin -- one you can run to the grocery store and assemble in under 5 minutes -- but for a fast and easy warm-weather treat, I was surprisingly satisfied with it! 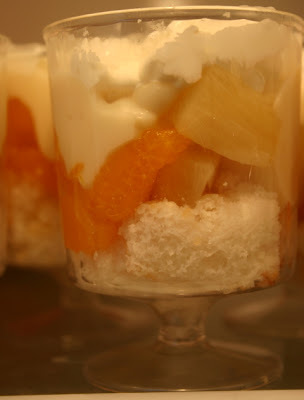 Next, mix the drained pineapple and oranges, and scoop about two tablespoons of the fruit into the cups on top of the angel food cake cubes. Spoon in half of an individual serving size pudding cup. Top with Cool Whip and refrigerate until time to serve. As DH says, these are great and also guilt-free! If I'd paid attention to the tea catalog, I wouldn't have been so surprised that this tea came in a tin. Anyone here read Japanese? I'm being cautioned about something, but what? 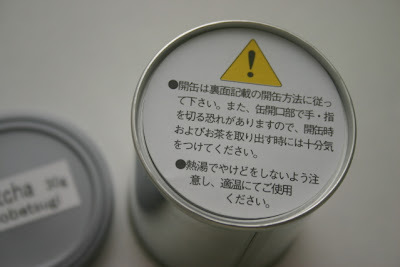 On the other side of this little piece of paper is more Japanese text and a graphic of hands carefully opening the pull-tab can. I'll bet the Japanese lawyers made them do that. So I *cautiously* opened the can so the powdered tea wouldn't spill all over the place. It didn't, because it's still in the bag! 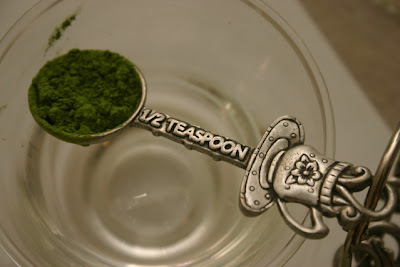 After opening the bag of Matcha, I carefully measured out just under half a teaspoon (the directions said half a teaspoon for 6 ounces of water, and my little tea-tasting glass is 5 ounces). My first "whisking" didn't result in too much foam, so I decided I'd probably done it wrong and tried again. Number two looked only slightly foamier, so I decided it was time to drink up and move on. 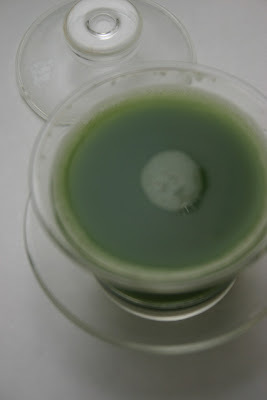 Besides, this may be what "thin" Matcha looks like anyway! I have to tell you, "Matcha Saturday" almost didn't happen! First, I realized late last Friday I had failed to place a new order with Harney and hurriedly went online to play catch up. Bless 'em, it arrived Wednesday, so I'm good for tea tastings for at least a few more months, Lord willing. 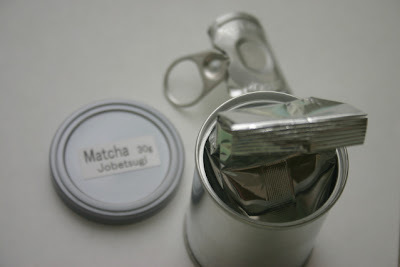 Then yesterday, I realized I failed to order a Matcha whisk, and the local tea shop is out of Matcha whisks, but I read on the Internet you could use an ordinary wire whisk instead if you had to. (Later, when I read the book, Michael Harney said the same thing.) So I figured with my mini-wire whisk this Matcha process wouldn't exactly be "authentic," but at least I could give the Matcha a whirl. (So to speak.) 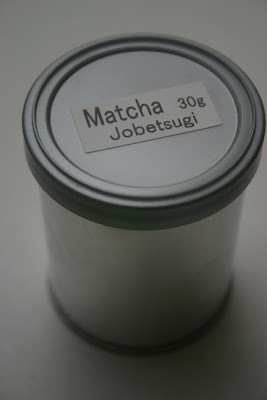 I don't know how much of a difference it makes that I bought the cheaper thin grade rather than the more expensive thick grade of Matcha, but hey, I was trying to be economical! Appearance: A rather bright apple green powdered tea. I'd like a T-shirt this color. Steeping temperature and time: Just under 1/2 teaspoon of tea, 175 degrees, 30 seconds (or however long it took to whisk the tea). 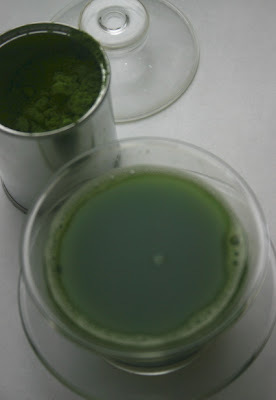 Scent: I had to force myself not to think about the powdery appearance, but when steeped I realized that oh, it smelled just like green tea. 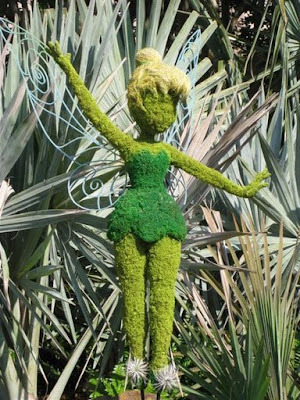 Additional notes: Michael Harney tells of visiting a factory where Matcha is made and says he had to "don protective clothing as if heading into surgery. I even had to pause in an airlock where machines blew off from the protective clothing any particulate matter that might contaminate the powder." And if, like me, you would enjoy seeing how someone who knows what they're doing prepares Matcha, check out this brief video on YouTube! Do you remember several years ago when, in one of her ever-changing stages of life, Madonna began to try her hand at writing children's books? I never actually bought one of the books, but I did flip through them at the bookstores enough to know they were called "The English Roses" and had various girl characters. I was intrigued by the books, as I am by Madonna herself, and I was equally intrigued by the fact Harney and Sons came out with a line of teas based on the books. 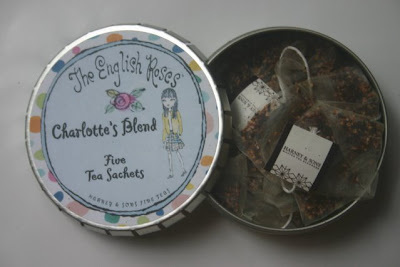 I never bought one of the teas, either, but I did receive one as a gift from a friend recently. 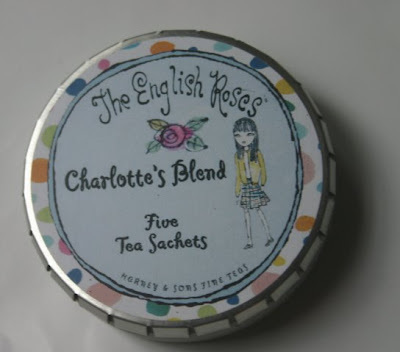 "Charlotte's Blend" is a caffeine-free "tea" that is raspberry flavored. When I opened the tin, I couldn't help thinking the sachets look like little packets of birdseed. Lucky for me, this raspberry blend tastes quite nice. 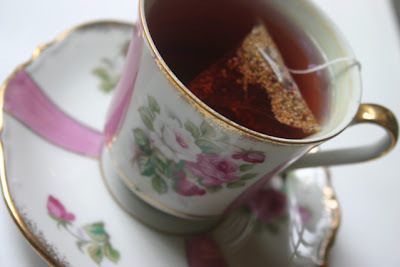 I love raspberry tea but often find it to be so sour it's downright pucker-worthy. This was just a nice, mellow, raspberry flavored tea. Harney doesn't appear to carry this in its catalog anymore, so I'm lucky I got a tin before they've disappeared. Two weeks ago, when some friends and I went to Atlanta for a special birthday lunch, we also visited two antique stores before heading back home. 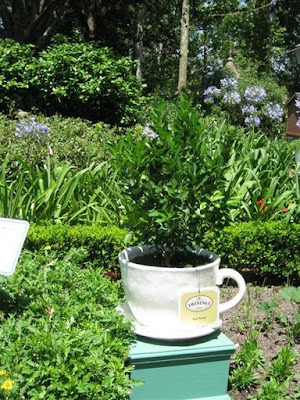 At one of them, I found this little 4-1/2-inch-tall teapot that is, I can only surmise, a tea bag holder. Have you ever seen anything like this? I hadn't. It has sort of a sixties vibe to me. 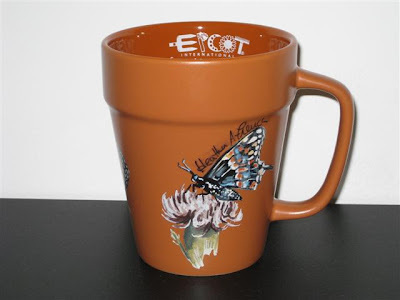 A week after I bought it, I saw in another antique mall a mug that had a very similar design dated 1964 (a vintage I share, incidentally), so I'm guessing that's about how old this piece is. 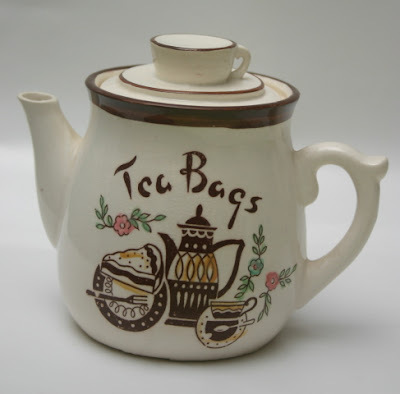 It does have a working spout and could actually be used as a teapot, but I think I am going to use it to hold teabags for all that iced tea I will begin drinking soon. 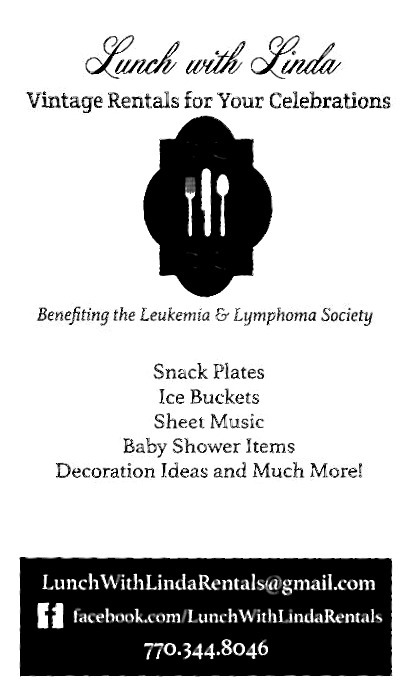 I especially liked the lid, with its little teacup design, and the price: $6. 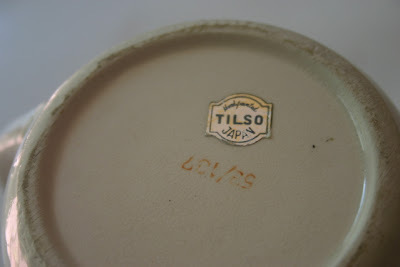 The sticker on the bottom says "Handpainted TILSO JAPAN." Tilso is a company I've never heard of before. It's times like this I wish I was friends with the staff at "Antiques Roadshow" so I could get some answers about the sometimes puzzling world of teawares! 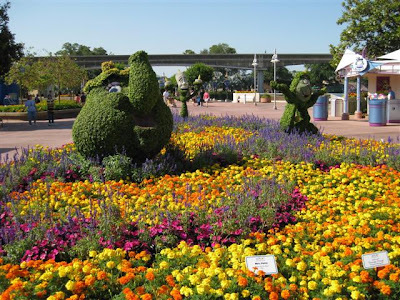 A guest blogger reports from Epcot! nice to look at. 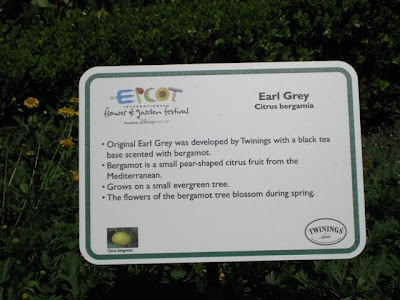 I don't know if you are familiar with Epcot or not. 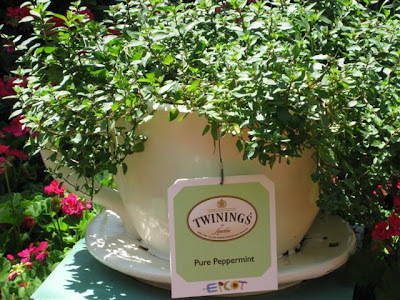 When Steph first wrote of the special color-themed Tuesdays she is hosting over at her Steph's Cup of Tea blog, I wondered if I would have anything to contribute. Last week I knew I could come up with a few things in robin's egg blue, but yellow? 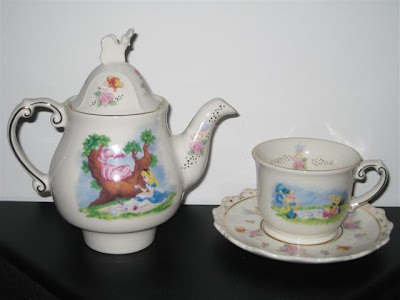 Well, I started looking around and discovered I have quite a few yellow things related to tea, including a piece from my most-treasured tea set, my Royal Winton Welbeck teapot. 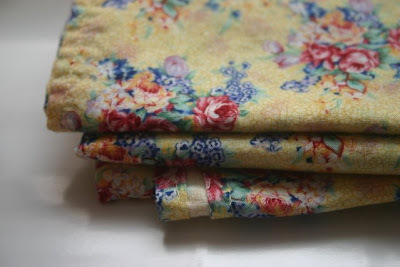 Other yellow goodies: These napkins my mom made for me in a Welbeck print fabric found at Jo-Ann about 10 years ago or so. 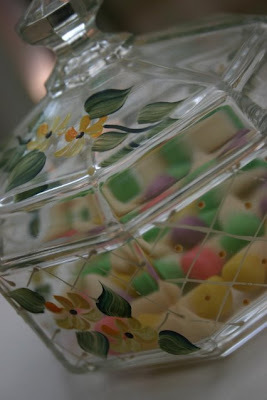 A French glass candy jar still bearing a few leftover Easter candy corns. A tablecloth I found on Etsy a while back (but to be honest, I thought the photos were accurate and expected an *ivory* background. If I'd only read the description more carefully!). 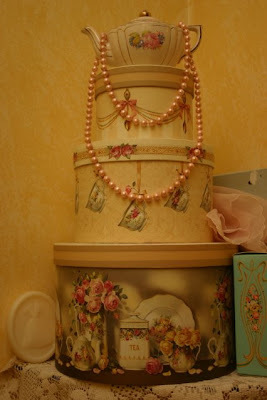 Sandy Lynam Clough hatboxes on a shelf in my bathroom. 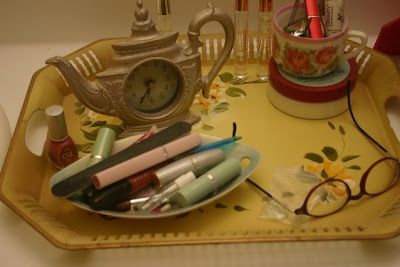 And a favorite tole tray, also in the bathroom. 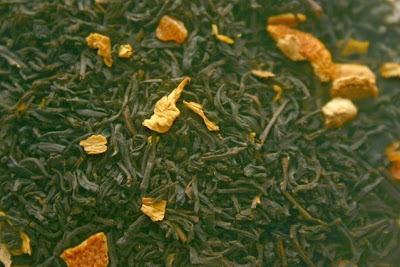 Finally, I love the yellow and orange bits (pineapple chunks and dried orange peel) dotting the landscape of my favorite tea in the world, Emperor's Bride from The Tea Room in Savannah (recently restocked thanks to a generous gift from my friend Kathy). 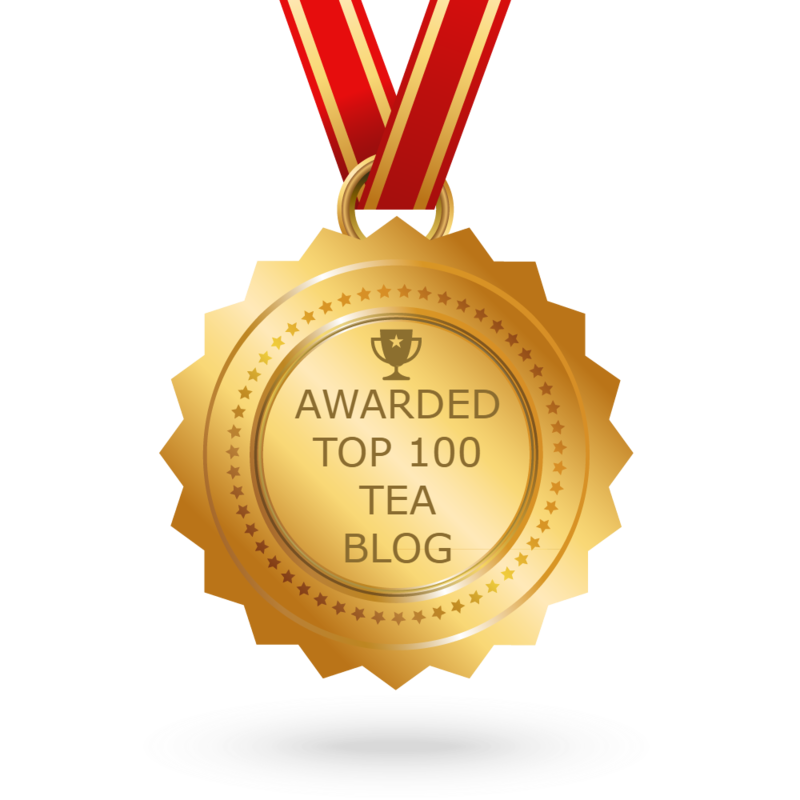 And please note: Tomorrow "Tea With Friends" will have a special guest blogger you won't want to miss! OK. I know. 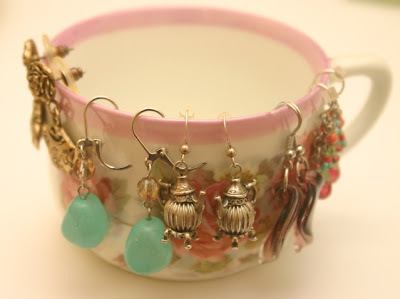 I have probably written about tea-themed jewelry a bit overmuch in recent weeks, so if you'll forgive me just one more jeweled post, I'll cool it, I promise! 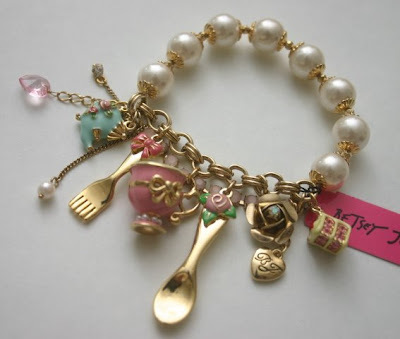 But with the last of my birthday funds I splurged on what instantly became my most favorite tea bracelet ever, and I just had to share this tea party charm bracelet from the amazing fashion designer Betsey Johnson! I "met" Betsey years ago thanks to a dear friend who taped a program featuring Betsey that aired on the Style network, I believe. My friend had been in the habit of taping Rachel Ashwell's Shabby Chic programs, and when she happened across the flower child/passionate collector/Bohemian girly girl Betsey, she thought I might like her too, and I did. It's not the fashions I'm interested in, it's Betsey herself. When I first saw her, she had yellow hair tinged with hot pink, and she was in the habit of collecting tiny shoes and dying old lace hot pink. How can you not love a woman 60-plus who still ends her runway shows by performing a cartwheel? 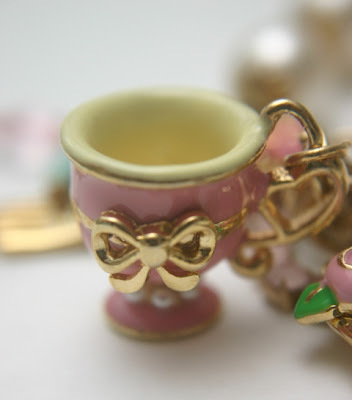 Yet I somehow missed the memo when her "Tea Party" line of jewelry debuted last year, but I ran across this bracelet online and had to have it. 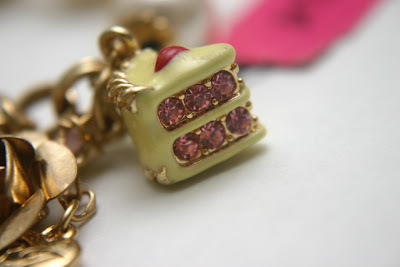 A slice of cake with "layers" of pink rhinestones? Love it! ... is a sweet little red heart! 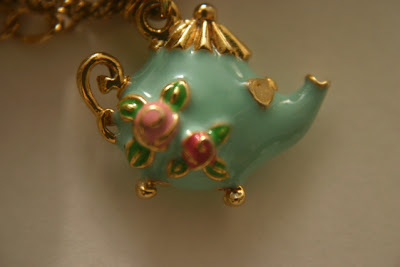 This robin's egg blue teapot charm is just adorable, and this bracelet has so much of all the jewelry things I love -- rhinestones, pearls, a sparkling rose, a pink crystal, a dangling heart -- I felt she made it just for me. 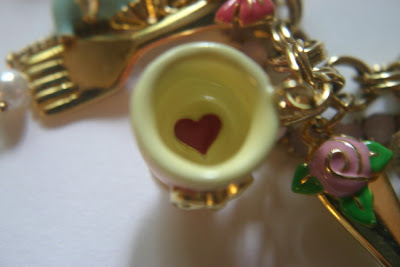 I can't help wondering what inspired Betsey to design a line of tea-themed jewelry, but I'm certainly delighted she did. 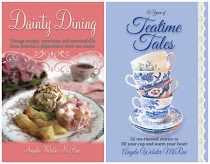 Inspired by "robin's egg blue"
New book: "Tea Room Recipes"